A new version of Harp was released this week. Whether you using the Harp Platform and Dropbox, keep GitHub projects in one main directory, or use Harp as a headless web server, the latest version of Harp includes updates to Multihost that will be useful to you. You may leave off sudo if you’re on Windows or already have admin privileges. If you’re new to Harp, get started quickly here. Harp’s Multihost mode serves every subdirectory within the directory you specify. If you run harp multihost inside a folder, all the projects inside will be available in the browser as subdomains of harp.nu. Once you run harp multihost, you can visit your local server in the browser (localhost:9000 by default) and see the list of projects. Visiting any entry will take you to that project, served at a subdomain of .harp.nu. So, in this example, the sintaxi/ directory would be available at sintaxi.harp.nu:9000. We’ll have more examples of how you can use Multihost in the docs this week. The especially curious may also review the commit log. This week, the developer of the WordPress to Harp script wrote a post about a poetry blog he started with Harp. With Harp, if you want your source content files to work as a static generated site, then you must refer to urls using .html. In the meantime, Remy has put together a pack called Harp Static, useful if you want a kind of strict mode, something witch Harp doesn’t have right now. Publishing your site with the Harp Platform. It runs Harp in production, so you automatically get clean URLs, just like with harp server. Trying the Harp buildpack for Heroku, featured in the previous edition of Harp Weekly. Using what Eric Drechsel developed: a small shell script that removes HTML extensions and deploys your Harp project to Amazon S3. The next edition of Harp Weekly will be right after Static Showdown. 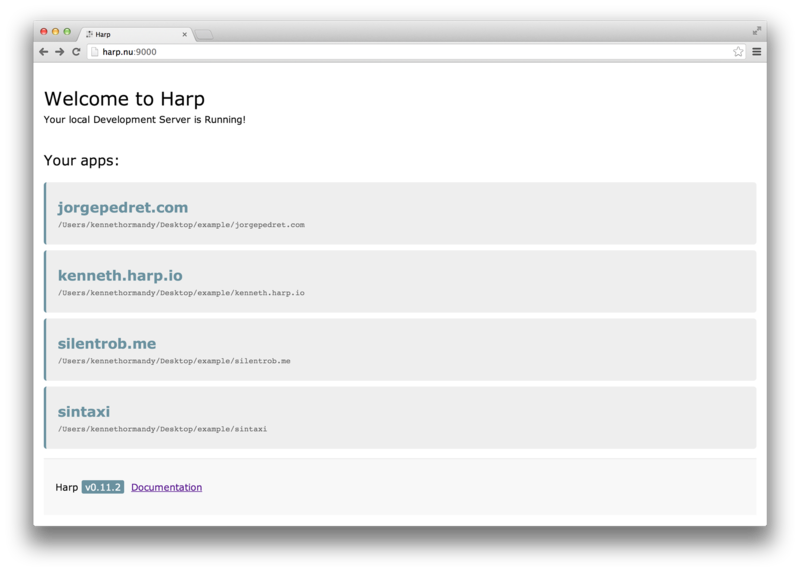 Make sure to post how you’re using Harp; we’ll help share your entry through @HarpWebServer on Twitter.